CRAB APPLES: First and foremost we need to tell you that we cannot accept crab apples as one tree alone meets our total needs for the year. We are sorry as there are so many crab apples in this city. As I laughingly state - we just need a scientist to find that crab apple juice is the new superfood and we will be in business!!! 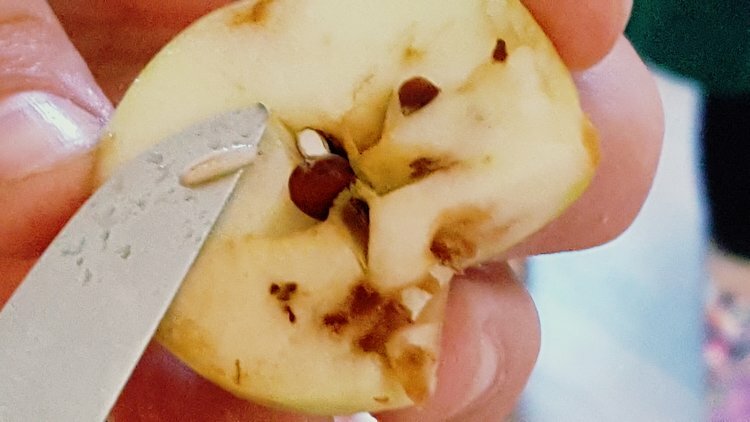 TEST FOR APPLE MAGGOT: Please cut 10 of your apples in half to see if there are little brown trails through the white flesh of the apple. These are made by the larvae of the apple maggot fly and if you keep looking you can also find the white worm itself. Although individual homeowners can choose to make applesauce with these apples, we will NOT accept them. If 4 or more of the apples are infected then we cannot accept them. We will test your apples as they come in and will send them back home with you if they are infected. Apple maggot at 11, 2, 4, 6 and 8 o'clock. Badly infested apple with actual maggot on the knife. We are currently planning our summer picking season and welcome on-going fruit donations. Please fill in the below form or contact us directly at 780-244-0129. We have more requests than ability to pick so we have to use a sliding scale. If you pick and deliver we will probably take them as long as they do not have apple maggot. If you pick and just need us to pick up and they do not have apple maggot, then we will take them. If you need us to pick AND have a ladder or 2 AND no apple maggot we will do our very best to come. If we are on our own, then the pick slides to the bottom of the list. I am sorry. We are volunteers and can only do so much and the easier the pick the more attractive it is. We cannot accept apples that have been on the ground due to contamination. Those apples will have to go in the garbage. No garbage bags please as they are full of toxic chemicals. Please use boxes, grocery store plastic carry bags and reusable cloth bags. We need you to sign a form giving us permission to pick in your yard and this is what we use to follow CFIA guidelines for being able to follow all our fruit to their actual source. You only need one form per year. Please call us prior to dropping off apples. Do not bring them and leave them outside the hall as we cannot use them without being able to trace their source. and Tuesdays of each week from 9 am until 2 pm. What to do with excess apples? We will not be able to pick all the apples offered although we will try our best. If you are left with apples there are a couple of options. Check with your neighbours to see if they want them. Consider offering them to local group homes, senior residences or even leaving them on the front street with an invitation for people to take them home. Pick and put a box out on the front street with a sign. List them on Kijiji and see if others want to come and pick. If you have picked them check with OFRE (Operation Fruit Rescue Edmonton) as they often run their apple cider press and you can turn your apples into lovely apple cider.